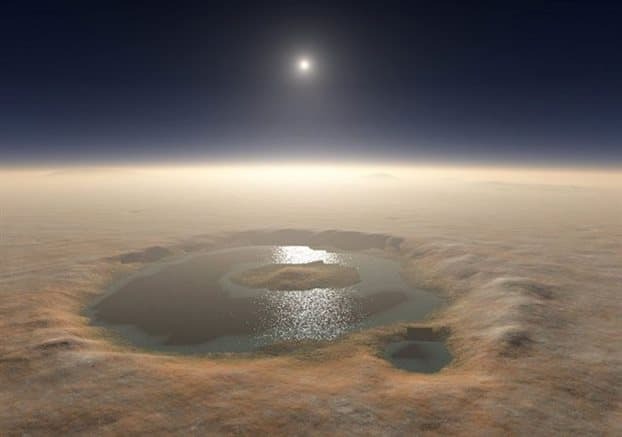 Presence of water on Mars has been a topic of particular interest among the science community and that is why the red planet is in the headlines every now and then. Enough evidence is present which suggests that water once flowed in abundance over the surface of Mars. Nasa's research suggests that water still flows in some places on Mars but not in volumes as large as in earlier times. So where did it go? And why did it go? A new research published recently suggests that the rocks on the planet absorbed the water. Although the surface seems all dry and dusty, it will not be surprising to find the portion beneath the surface all wet, suggests the research. On comparing the properties of rocks on Mars with those present here on Earth, scientists found that the basalt rocks present on Mars can retain approximately 25% more water. Calculations done by the physicists suggest that more than 9 percent by volume of the Martian mantle may contain hydrous mineral species as compared to 4 percent of Earth's mantle. The cause of the disappearance of water is also attributed to a process known as photolysis, a process through which the sun's rays separate water on hydrogen and oxygen. This occurred soon after the magnetic field of Mars collapsed and the planet could not shield itself from the strong sunlight. As a result, the water was lost into space. Today, water is mostly found in the form of ice or vapor. The north polar ice cap is the only place where the frozen water is visible although it is present in some other places as well. The search for water on Mars reflects our intention of finding any form of life but no success has been achieved so far. The current atmospheric conditions on Mars suggest that it might be difficult for any life form to flourish. But it is the inquisitive nature of the human mind to keep exploring the unknown and that is why we get to see such marvelous findings quite frequently. To quench your thirst for some more information on mars here are some interesting links: Nasa finds evidence of liquid water on Mars, Evidence of water on Mars. You might also like to read a really cool short story by Arthur C. Clarke, 'Talking of Space: Report on Planet Three'. You can find it on google books easily.